I decided to give this place another chance while in the area recently. It was the Tuesday after a Bank Holiday and my first observation was how quiet it was at around 12:30pm - I recall on my previous visit a couple of years back it was rather busy. Apparently has been affected by the flooding and re-opened earlier this year and had a bit of refurb work done as a result. I am pleased to say that the bar service was much more friendly than on my previous visit, and as that was the only thing that let the place down last time I'm going to up my rating accordingly. I noticed the real ales were listed on a chalk board above the bar, which confirmed my suspicion that perhaps the beer selection was split across the two bars. I wanted to try the Watermill's own beers so went for the W'ruff Night (5.0%) which I think was £3.85. A very nice pint and because it was quiet I got the pick of the seating so had a nice view of the water running by outside. I gave in to temptation and ordered food, and a second pint to wash it down. This time Dog'th Vader which again I think was 5% or so. A dark stout/porter and very pleasant indeed. The haddock and chips I ordered was very tasty. I am fussy about chips, and they were good. The tartare sauce and mushy peas were also well above average. A polite young lad was doing the rounds asking diners if all was OK with the food, and so you get the impression that they want to impress. The pub started to fill up a bit around 1:00pm-1:30pm but was not full by any stretch of the imagination. Well worth a visit, in my opinion. I would seriously consider staying a couple of nights here just to work my way through the beers! 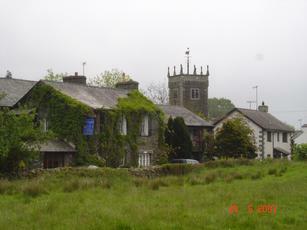 Lovely pub and brewery on the main road from Kendal to Windermere in the small village of Ings. 13 ales, 1 real cider and Framboise on tap. A quantity of the ales are from the onsite brewery which is aptly named Watermill Inn & Brewing Co. Having never drunk any of their beers before I chose a pint of Collie Wobbles @ 3.7%. 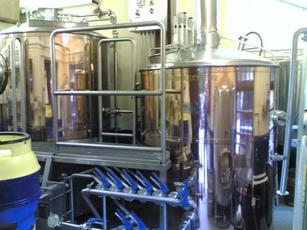 Brewing was in process in the brewery that is visible from the River bar. Called in here after reading about its impressive selection of real ales, and the place looks very inviting from the road! On entering you are presented with a choice of two bars - the River Bar to the left or the Smithy Bar to the right. I opted for the River Bar and ordered a pint of "Bit'er Rough" which is a pale coloured ale and rather pleasant. There were about 6 hand pumps in front of me so plenty to choose from. The signage boasts 16 real ales, so perhaps there were additional pumps in the other bar, or maybe it's a rotating selection. The bar area itself looked very traditional, quite small and cozy but with a fair bit of seating. Bar service was not particularly friendly, bordering on surly. I'm not one for excessive awkward chit chat at the bar, but I do expect basic manners such as a "thank you" when I hand over my money and a "here's your change" - maybe even followed by "enjoy your pint" if we were to push the boat out. But sadly no, none of that, and from handing over my cash the transaction was carried out in silence. I was left to feel like I was a bit of an inconvenience, so I didn't stay for the second pint I was originally contemplating. When sat down with my drink, the table staff around me serving diners seemed very polite and friendly. There was a mix of clientele in the place but seemed mainly to be tourists. Drinkers do not feel out of place amongst the diners, like you can in some places. Was a bit disappointed by the service, but other than that, was a nice pint in a pleasant and busy pub. My wife , dog & I spent three very comfortable nights at the Watermill. The room was very clean, cosy and comfortable, a little on the small side but everything else made up for this. Evening bar meals were exceedingly good and well priced, as is the vast selection of beer. Breakfast was also very good. If you have a dog this is certainly the place to stay as the dogs are made to feel most welcome, even by being able to sit with you at breakfast. We shall definitely be returning. 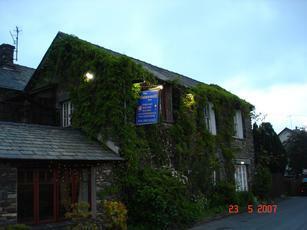 Great cosy traditional real ale pub on the main route to Windermere. 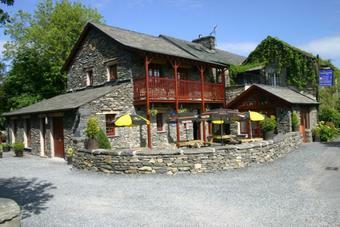 Many people call in here en route to the Lakes and I would recommend you do too. Had a pint of Dogth Vadar from their micro brewery and was so impressed I purchased a few that were available in bottles for the road.